Sweet or savory, I love tarts! I love the making and the eating. It’s probably one of the things I make most often when I want to wing it with whatever’s in the kitchen. 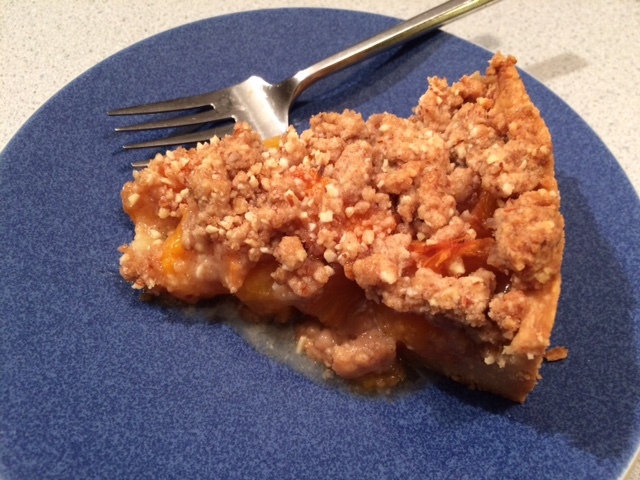 I was delighted to try a new dessert tart, David Lebovitz’s Apricot Crumble Tart, the selection from My Paris Kitchen for this week’s Cook the Book Fridays. Starting with the crust, this one hooked me in. I’m a huge fan of Dorie Greenspan’s Sweet Tart Crust, but this one was even better. It came together almost instantly in the stand mixer, then pressed easily into the pan. The high sides of a springform pan provides space for lots of sweet fruit filling. This tart can also be done in stages. I made and prebaked the crust and prepped the cinnamon crumble topping one day, then prepared the filling and baked it the next. I’m not sure that apricots are grown locally in New England. I haven’t seen them at the farmer’s market. At the largest produce market around, the apricots were from Washington State. They were also HUGE, almost the same size as a peach or nectarine. I was expecting to buy 15-20 apricots, but just 8 giant apricots weighed in at slightly over two pounds. Rather than quarter the fruit, I cut them in eighths which seemed to approximate the size that quarters of a normal-sized apricot would be. The fruit filling generously filled the crust. Then the crumble was sprinkled on top before baking. The visual cue for the tart’s doneness was nicely browned crumbs on top. That took a long time to happen. After the initial 50 minutes, the crumble seemed uncooked and the fruit was still firm. I ended up baking the tart for an additional 50 minutes, and even turned up the oven heat for the last half hour. I recall having a similar issue when we made David’s quiche. I recently calibrated my oven, so it wasn’t that. Hopefully next time I make one of his tarts, I’ll remember to start at 375F instead of 350F to reduce the baking time. As a whole, this tart was good, but I’m not likely to seek out apricots just to make it again. I will definitely use the crust again, being sure to grease the pan a little more than I did because I experienced some stubbornness when serving slices. The crumble might reappear as well. I’m curious how this would be with the more plentiful peaches or nectarines. That might be worth a try. 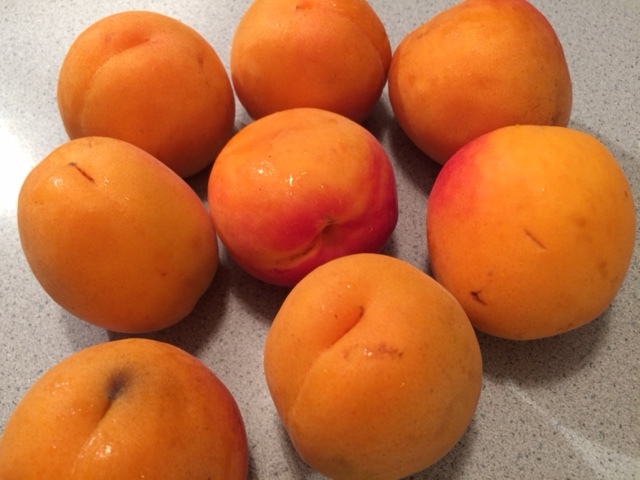 A suggested accompaniment to the tart is Apricot Kernel Ice Cream made from the pits of the apricots. I didn’t try that this time around because I didn’t have enough of them. A full recipe calls for 50 apricot kernels. 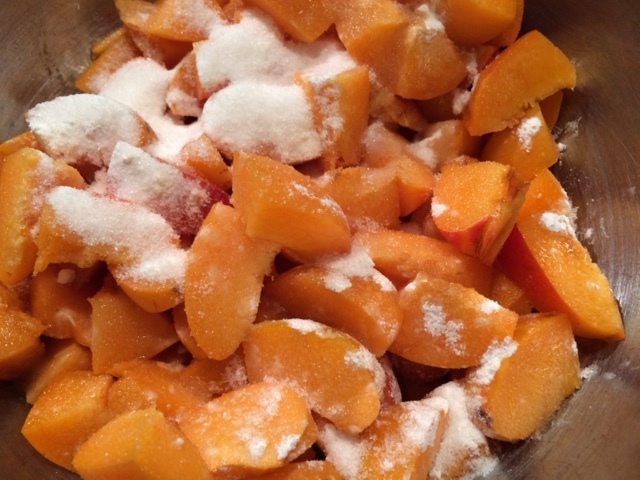 Had I used 15-20 apricots, I would have made a half-batch but I wasn’t going to get very far with just 8. I’ll save that one for another day. The tart recipe can be found on-line here at Leite’s Culinaria or on page 309 in David Lebovitz’s My Paris Kitchen. To read about the other Cook the Book Fridays bloggers’ tarts, check out their links here. Happy Friday All! Posted on 5 August 2016, in Baking, Cook The Book Fridays, my paris kitchen and tagged Cook The Book Fridays, fruit tart, my paris kitchen. Bookmark the permalink. 20 Comments. Isn’t that interesting, because I had exactly the opposite problem and mine nearly burnt at the 50 minute mark this time around. I don’t recall having that problem the last time, but this time the edges were really a little more than just browned. My oven is a perpetual mystery to me. It’s small and weak and does NOT like any recipe which requires opening the door frequently to baste or anything else. Oh, and it tilts badly so cakes come out decidedly lopsided. But then, every once in a while, it suddenly gets second wind does what it’s supposed to, just to keep me on my toes. Sounds like mine isn’t the only one. Hi Betsy, it seems you were up for the tart challenge in adjusting your timing to prepare a lovely finish- though it is crazy given your recent oven calibration. The tart sounds nice, even more so with the easy to work with delicious crust! Hope you and Howard are well and enjoying the summer season. It’s so frustrating when the cooking times don’t work. Your tart looks so perfect to me. We enjoyed ours and I would like to repeat it again with other fresh fruits soon. Betsy, I couldn’t agree more. The tart shell was lovely, and I did like the crumble. My store-bought apricots were very large and fairly tart compared with the ones off my tree. But it was fun and did produce a beautiful dessert. I’d probably rather have one that is more delicious. But a wonderful starting point. Have a lovely weekend, my friend! Really liked your write-up, Betsy. Yours are always filled with explanations of whys and wherefores. I compared Dorie’s sweet tart recipe to David’s crust recipe and the confectionary sugar seems to be the big difference. Egg yolks also. I didn’t find this one chancy but sometimes Dorie’s is a fail with me. My problem, certainly not hers. No apricots for me but suggest you use cherries sometime. Thought the crumble was delicious albeit a bit heavy for some more delicate fruits but will use that again. I know you are having a wonderful farm/crops summer and this Iowan loves that the farmer in you is coming out in spades (play on words there – get it, spades as it farm tool?) Tell Bella it’s okay to bark at hawks but only if they are in the sky. Don’t tangle with them otherwise. I really liked this crust too! Funny how the times differed from person to person. Mine was right on for the 50 minutes. I started to check it at 45 just to be sure I didn’t burn it. I was a bit worried because this was the first time I baked in my new oven. I adore apricots, so this was a winner with both Bill and I and a few of my neighbors. 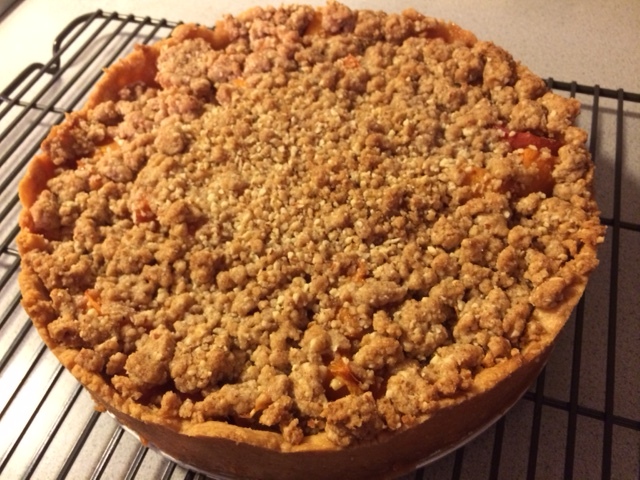 I can see using many different fruits with this tart dough and crumble. Sorry to hear about your berries, Betsy. I wish you were closer, I would love to share my crop with you. I just picked another colander full this morning. This is the best year I’ve ever had with my blackberries. Mine took a little longer than the recipe called for, as well. And my apricots were enormous, too. We had a heat wave unnaturally early in the season this year and I think it made for a bumper crop across the season. 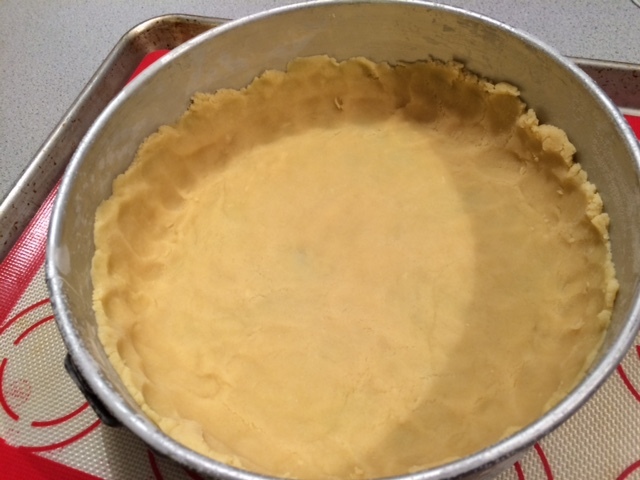 Tart crust is my nemesis, so I’m always in the market for a new, more cooperative, recipe. I’ll have to make this scope with peaches, because apricots are long gone here in Virginia. That’s crazy that your tart took a full 50 min extra! Beautiful! This is such a photogenic dish, eh? That’s kind of funny how huge the apricots were! Must be all that water they got this year. :) I imagine it being really great with nectarines, maybe because of that nice zingy acidity they have? Anyway, all looks great and, you know, I did leave my tart in longer the second time…not 50 minutes longer, but at least 10. Happy August, Betsy! Wow that is a long cook time. The tart looks good and delicious. I recently bought David’s Ice Cream cookbook and have enjoyed a couple of recipes from that. Happy Summer Betsy. Mine was overdone at 50 minutes, I think. Too browned for my liking. Some of it is my oven running a little hot, especially on one side, I think. Nevertheless yours turned out fantastically. Looks so delicious! How strange that you needed to cook your tart for that much longer. Others were concerned with overbaking their tarts. Those are definitely MONSTER apricots though…wow. I didn’t know they could get that big. Your tart looks really great! I agree that you ought to keep an eye on it because it can get too browned.Every oven is different. Well done!! I love the crust too, and the crumble topping! Your tart looks wonderful. We enjoyed it with scoops of ice cream! Lovely tart you baked there, no ice cream needed! I did everything by muscle power for the crust and the crumble! Your tart looks great. I did not find a longer time needed for the tart itself, but found my crust cooked too quick. It did come together easy though in the stand mixer. I too, did not make the ice cream as a lot of us, but I did not even add any which I would do next time. I tried mine with peaches and plums – it was very good. I loved the crust too, especially the technique for making it. I used peaches and it was wonderful! This looks sooo good! I am going to try to cut it down for a smaller version.